Your website seems fast enough to you? Are sure that your visitors share the same opinion? Through that question, we intend to talk about the huge differences of web connections among your users… and about the effects about how they will experience your website performance. If you are aware of the loadtime impacts on user experience and numerous other key points for your online business, you should as well be quite concerned on testing and monitoring your website speed… That’s definitely something we love to hear at Dareboost! That said, are you sure that your results are relevant? Do you test your website within the same conditions than your users’? “The web isn’t experienced the same way everywhere,” reminds webworldwide.io. 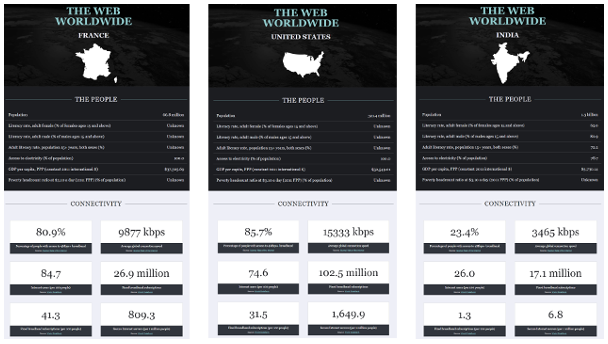 A useful website edited by Tim Kadlec, that compiles, country by country, dozens of data about internet connectivity, usage and affordability. An excellent starting point to set up your web performance tests according to the main countries your users are browsing from. Bandwidth impacts on speed is quite a well-known topic for most of people. Note that for classical web browsing, the downstream bandwidth is the main matter (as the amount of uploaded data is quite limited). That bandwidth directly impacts the loading time of your web pages: the heavier they will be, the more likely the bandwidth will be a bottleneck. In other words, heavy content are much more penalizing for those of your users with the weakest bandwidth. As web connectivity conditions are so various, you can’t focus only on the best case scenario when conducting website speed tests. According to the last statistics from Akamai (2016 Q3, see the table below), the average downstream bandwidth is about 10Mbps in France. 2 times slower than in Norway! Another example: while the average speed is 16,3 Mbps in the USA, it is only 4 Mbps in India! Website owners with an international audience are not the only one who should beware of bandwidth heterogeneity. As an example, about 25% of french people still have a slower than 4Mbps internet broadband connection. Moreover, mobile usage has also to be considered, with a fluctuating bandwidth according to the location, network load or again the fair usage policy that providers may apply (bandwidth cap). As a consequence, at Dareboost, we highly recommend you to test your web pages speed regarding several connectivity conditions, as representative as possible of your audience. You should, at least, test the speed of your website against both mobile and desktop connections. Whereas latency effects are not as well-known as bandwidth ones, its impact on web pages loading time is huge. As explained in our previous post dedicated to latency, this (that is *not* correlated to the bandwidth) is the delay for the data to be transported from point A to point B over the network. The latency impacts each of the data exchanges (back and forth) between the web servers and the user web browser. Logically, it depends on the “distance” between your users and your web servers. This is something to consider while testing your website speed: you should launch your tests from the main locations where your users are! 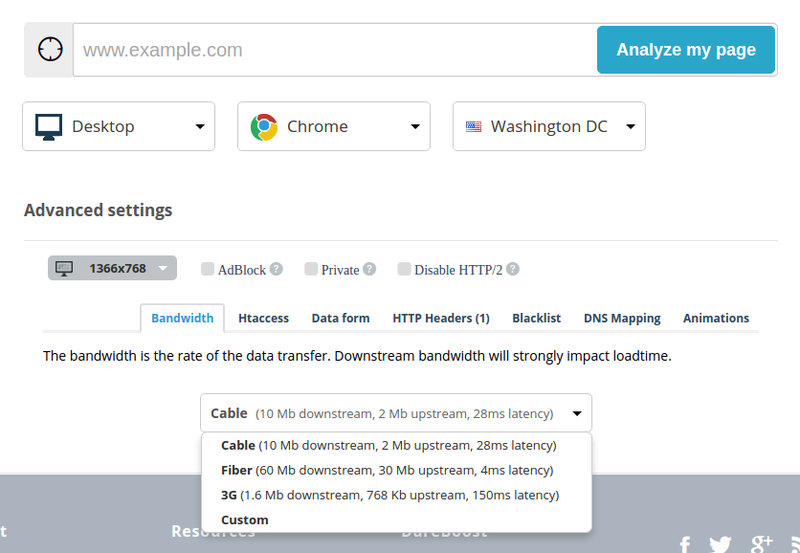 Those of you targeting an international audience may consider using a CDN (Content Delivery Networks) in order to to reduce this latency, by bringing your website data closer to your users. Another important thing to have in mind: not only the latency relies on distance, but also on the connection characteristics . Indeed, mobile internet connections are still generally slower than the classical ones, even if they are an increasing part of the web traffic. As an example, the latency is generally way higher with a 3G mobile connection than with a DSL one. You would need a 4G connection to get similar latency values, and you will have to wait for the 5G to fulfill its promises to forget about latency issues! Although, we already have published a post dedicated to our advanced settings, available for our speed test tool as well as for our monitoring features. Do not wait any longer to launch a new web performance test for your web pages!